Share the love with one of the prettiest grandparents ornaments in our collection! 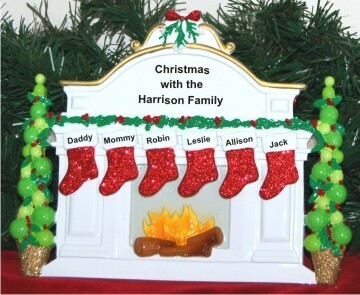 The Christmas mantel: 6 grandkids love to grandparents personalized Christmas ornament is one of our lovely tabletop ornaments personalized in an artistic, hand-painted font. Featuring very pretty details brought out in rich and festive colors, the Christmas mantel and stockings 6 grandkids tabletop ornament will be enjoyed throughout the holidays when displayed on a coffee table, knick-knack shelf or even the mantel itself.